The size and shape of New Zealanders has changed markedly over the years and a growing number of aged care residents cannot comfortably fit into a ‘standard’ size bed these days. Comfort, function and safety should all be primary considerations when ordering a new bed for them. And, with today’s staffing shortage challenges, it’s just as important to choose a practical bed, which makes life easier for your teams to provide high quality care. 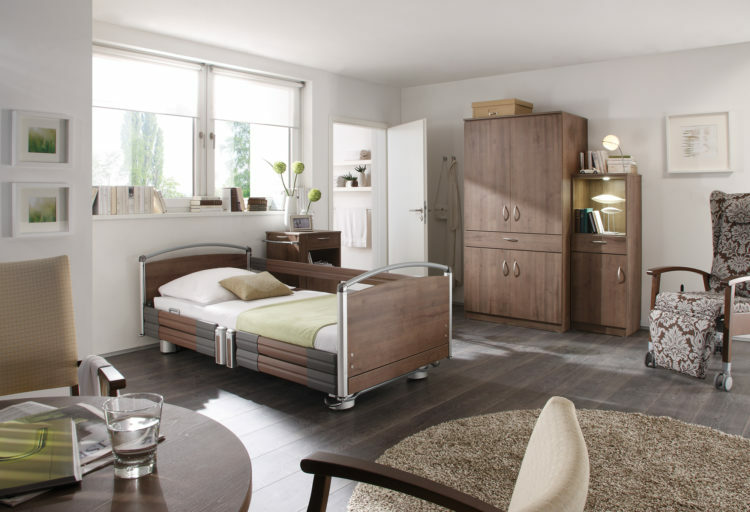 A bed should ideally maximise a resident’s functional ability and independence. Being able to get in and out of bed safely, or assist with their own daily self-care and dressing needs, goes a long way to improving someone’s quality of life and sense of self-worth. When choosing a bed, one of the first things to consider is the height and weight of the person concerned, as this will help you determine what bed to buy. Are their head and toes nearly touching each end? Would a bed extension be beneficial? Are they able to change position on their own, in which case how much room will they physically have? Many people feel ‘unsafe’ rolling from side to side in a single bed, fearing they might fall off. And if side rails are available, it can be distressing to find yourself in a position where the rail is right in front of your face. If total weight on the bed is a concern, then a heavy duty bariatric bed is a good idea. Remember the safe working load of a bed includes the resident, mattress, accessories and should allow for any additional weight of family members or carers who will need to lean on the bed from time to time. The Bock Practico range of beds are a popular choice for New Zealand aged care facilities. Short side support rails can be added as an accessory to help residents maneuver themselves in and out of bed (again, helping to maintain independence), or you can choose to fit full length fold down or drop down rails if more security and stability is required. Many carers like Practico’s central breaking function too, which locks all four wheels in place with a single lever located at the foot of the bed. Choosing the right size bed is equally as important and ‘super singles’ are becoming increasingly popular due to the extra space they provide. Super singles are often easier for caregivers too – there’s more room to use turning aids and sliding sheets to help maneuver an individual. The Bock Practico Ultra Low 4-section electric bed is a great super single option thanks to its range of features and useful accessories. Its safe working load is 220kg and it offers Trendelenburg (feet higher) and Reverse Trendelenburg (head higher) functions which are a huge advantage for residents who are bed-bound. These adjustments can be used to help treat respiratory conditions, oedema, high blood pressure in spinal cord patients and is a good pain management tool in palliative care situations. It’s also extremely useful when wanting to be in an upright position (to socialize, for example), and can help avoid pressure in the sacral area. The Practico super single also has a mattress compensation function which the single model doesn’t have. When the head of the bed is raised, it moves back slightly which helps prevent people from sliding down the mattress and shear injuries from occurring. This ‘Ultra Low’ bed can drop down to 250mm off the ground and rise as high as 800mm. This travel range makes transfers in and out of bed easier, and helps with everyday tasks such as changing sheets and making the bed by providing a good working height. Other key factors when choosing a bed is quality and durability. Are you investing in a high quality bed which will enable you to provide the best care for this individual and the next? In summary, there is definitely no ‘one size fits all’ when it comes to beds these days. But thankfully there are plenty of options and functions available to make life more comfortable for residents and easier for carers as well.